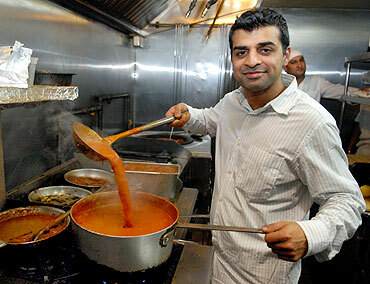 Rediff.com » News » How New York relishes the desi tadka! 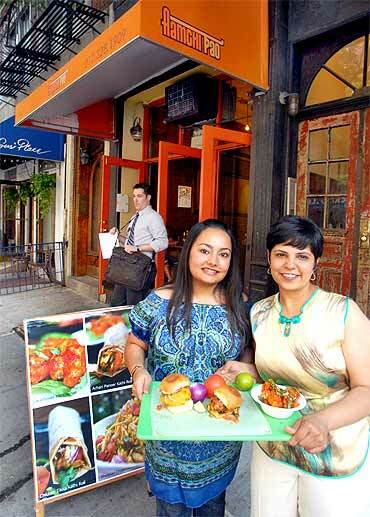 How New York relishes the desi tadka! For many, a meal in $10 or less means dining on a pizza or overloading a $7 buffet of indifferently prepared food or eating a hotdog. But New York is filled with not only award-winning food carts but also mom and pop restaurants that offer delicious and wholesome dishes for $6 to $8. With restaurants representing more than 120 cuisines including regional specialties, New York surely is the uncrowned gourmet capital of the world, writes Arthur J Pais. A young girl held her father's hand as he took a fat sausage topped with curry and mustard sauces from a street vendor near a Broadway theater in Manhattan, New York. "But Daddy where are we going to sit?" she asked. "Today, we stand and eat," he said, handling her the sausage and a paper napkin. Soon his wife joined them, a kathi roll from another vendor in her hand. The three had seen Lion King, spending $100 for each ticket. They were not skimming on a meal just because they had spent a lot of money on the Broadway show. "This is fun," said his wife. "I have never seen so many street food carts in my life all these years. I feel like I am a New Yorker now." 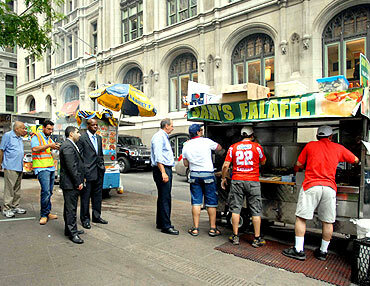 New York has an estimated 5,000 licensed food carts. An estimated 8,000 people, some of whom work for 10 hours a day, operate them. There are hundreds of people in their homes who help them make the sauces and keep some basic ingredients ready to grill sausages or meats on the streets. The food carts are not the only opportunities for those who want to have tasty and filling meals for less than $10. Hundreds of restaurants offer lunch for less than $8. 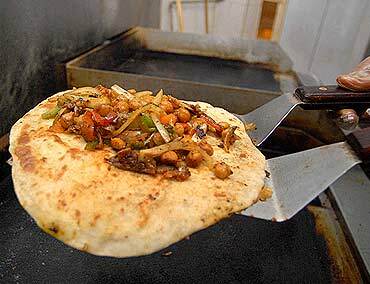 But if you don't want to fill yourself with the overheated food (unless you go to a restaurant when the buffet has just opened), you surely want to investigate reputed street food vendors or well-known salad bars or sit-in restaurants, such as Indian vegetarian restaurants, where a wholesome meal or a dosa costs about $9. If you want to dig into food from across the world but don't want to spend much money, New York -- especially the boroughs of Manhattan, Brooklyn and Queens -- offers beguiling street fare from more than three dozen countries ranging from Argentina (the tasty and spicy empanadas), Cuba (marinated pork cubes), Germany (sausages including curry wurst), Italy (deep friend calamari), Ethiopia (injera, the sour unleavened bread and chicken stew) Turkey (kababs) and India (from dosas to varieties of biryani). "I'm so happy that street food is taking a different turn," successful New York chef and restaurant owner, Jehangir Mehta recently told ABC News. "It's almost driving down to the philosophy of having a small local farmer selling produce; it's becoming more and more personal." Mehta was a judge recently for the Vendy Awards given in several categories to New York's smart and creative chefs. The awards do more than promote street food. Proceeds from the event go to the Street Vendor Project that fights for the rights of vendors. Mehta also knows that for less than $10 you can have a glorious food cart meal enjoying it, on a good day of course, in a park or a street corner. But you must be smart enough to look for the best carts that are hygienic and where the food moves very fast and the oil does not look slimy. Past Vendy winners have included Thiru Kumar whose dosa cart near New York City has made him a culinary legend in the city. The awards encourage street chefs to create a wholesome and clean food day after day. "In a city full of hot dog vendors and pretzel stands, the carts that draw the attention of Vendy Awards stand out as full-service mobile gourmet kitchens, turning out everything from Mexican huaraches to Austrian schnitzel," says ABC's Claudia Acosta. "A fast moving line means the cart is offering freshly prepared food," says Sati Sharma, chef and owner of several restaurants including Maratha Junction. Such a variety was unthinkable three decades ago when the Manhattan streets were overpowered by vendors selling hot dogs and knishes. Biryani Cart owner Meru Sikder, who has twice won the People's Choice Vendy Award, says he has no big secrets. He uses quality meats and fresh condiments. "If you want your customers to return, sell A-1 food and keep the prices low," he says. "And always smile." Street vendors consider the Vendy as their Oscars. Major newspapers run stories on the annual contest, and TV shows interview the winning chefs. "But once you get a Vendy, you have to be more careful than ever," said Sikder. "People watch you, and they will be sorry if they don't like the food very much." Had you seen Curry Hill's more than two-dozen Indian restaurants in Lexington Avenue a few months ago, you will feel like a stranger to the area today. While some of the oldest restaurants such as Curry in a Hurry, in business for three decades, and Pongal, more than two decades old, are still there, several others have closed down. One of them, Coconut Grove, which offered Chettinad delicacies from Tamil Nadu, lasted less than three months even though the food was very good, and the excellent Pongal restaurant family next door owned it. It is soon to be replaced by Cinnamon. Several restaurants on Curry Hill have offered Indo-Chinese dishes in the past three years but haven't succeeded in impressing customers. But Chinese Mirch, which now has a second restaurant in Manhattan, continues to offer spicy and redolent dishes such as the terrific Chicken 65, and chilly loaded lamb. 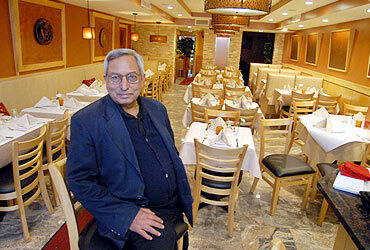 Chef and owner Vik Lulla has maintained the restaurant's standard very well, keeping the menu short. That means the kitchen is sure of each dish. Bay Leaf, which had replaced the once redoubtable Udupi, closed a few months ago and Tamba, offering an eclectic fare including dosas stuffed with chicken or lamb tikka, has taken its place. And next to Tamba, Gaurav Anand, the talented chef and owner of Bhatti Indian Grill, has redesigned the hole in the wall Kathi Rolls by Kabab Factory. "This is a much smaller place than Bhatti," Anand says, pointing to the more formal and more expensive restaurant across the street. About 15 customers can sit at his Kathi Rolls, which means his main business will have to come from the takeouts. "We have kept the menu down to a handful of items," says Anand, who himself marinates the food, though he cooks at Bhatti only on Mondays. "What is nice about this place is that it allows the customers to create their own combos," Anand adds. Vada pav of Mumbai? Now in NY! At Amchi Pao, which seats just about 12, one can enjoy tasty street food from Mumbai, along with customers including professors and students from the nearby New York University. The restaurant, which does a lot of catering, is owned by Surbhi Sahni, the pastry chef at D vi, one of the most expensive Indian restaurants in the city where a tab for two can easily come to $100, and Nandini Mukherjee, who owned Indian Bread Co.
Mukherjee closed the place, which was doing good business, and started Amchi Pao in the hope of attracting more business. She says she got the idea of offering vada pav and dishes such as kathi roll stuffed with curried meat after she catered for a Slumdog Millionaire movie party in New York over a year ago. If you ask American food writers to come up with quality restaurants that serve delicious fare under $10, they would struggle. The reason is simple: they concentrate on meat and fish restaurants. But those who look for vegetarian fare know that finding such fine restaurants is not difficult. True, there are some exemplary but expensive restaurants such as Pure Food/Vine that offer glorious raw food but the main dishes each cost about $18. So are Gobo and Caravan, Blossom and Candle that offer innovative and international dishes. Zen Palate, another popular restaurant with medium prices, offers exquisite vegetarian dishes influenced by Indian, Mexican and Southeast Asian cuisines. But expect to pay $15-$18 for a satisfying meal for one. But in many pockets of the city, you will find over two dozens classy but inexpensive restaurants run not just by Indians but also Chinese, Koreans, and the Israelis. Arguably the most famous among these is New York Dosa, run by the mustachioed, ever smiling owner-chef-server Thiru Kumar. 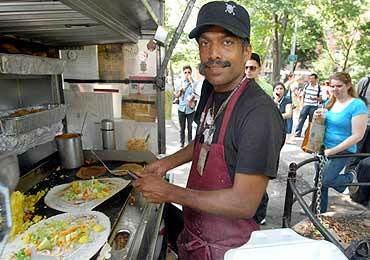 His dosa cart has made him a 'New York legend.' "A delicious, ultra-healthy meal-on-the-street that's well worth the wait (10 minutes)," wrote The New York Magazine a few years ago. On a recent Friday, you could count over a dozen languages ranging from Russian to Japanese to Hebrew to Dutch as their speakers enjoyed Kumar's treats. 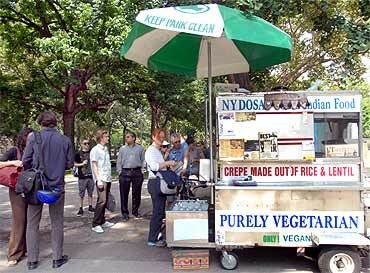 For some tourists, their New York trip is not complete without enjoying Kumar's dosas. The cart is mentioned in many tourist books in at least a dozen countries, he says. A few years ago, he was thinking of a franchise, selling dosas in several busy pockets of New York. "I still want to do it," he said not long ago. "But I am afraid I won't be able to supervise thoroughly and that could affect the quality."